This year, I grew fennel (Foeniculum vulgare) for the first time. I started fennel bulbs from seed in February under grow lights and transplanted them to the garden in late April. Fennel is grown from seed and enjoys full sun and well-drained soil. If starting indoors, begin about 4-6 weeks before the last expected frost date. If direct sowing from seed, plant seeds 1-2" apart and thin to about 6-12" apart. Plants should grow about 3-6 feet tall and will have lovely wispy fronds that will appeal to most pollinators (I found butterflies liked mine). 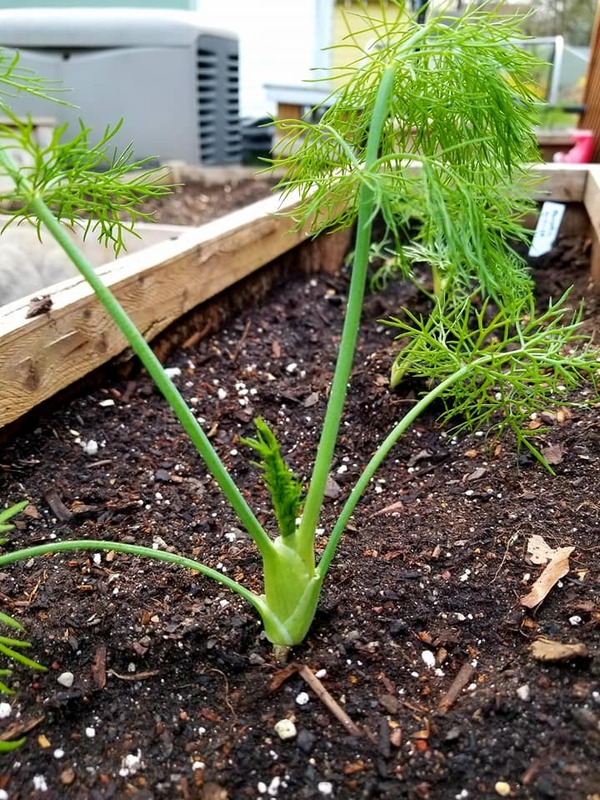 In my small garden, I was able to grow about 10 bulbs of fennel in two large planters. First growth indoors of fennel seed under grow lights. Because I grow food in such a small space, I want to be sure my space goes to food I will definitely eat. I don't tend to cook a lot with fennel, but do occasionally. I'll be honest, the challenge of growing something new is what got me to grow fennel this year for the first time. I'm happy to report that I have no regrets about growing fennel, and it was delicious. The fennel bulbs when first transplanted from the indoor seed pots. Both the fennel and the fronds (light greens at the top that resemble dill) are both edible. Fronds can be made into pesto, added to salads, sauteed with other vegetables and meat, etc. Fennel has an anise (licorice) type of flavor. I tend to like to roast it with a little salt, pepper, olive oil and Parmesan, but as you'll see if you make the Fennel and Seafood salad, it can be amazing raw too. The fennel got as big as my head (see below). Truth be told, I should have probably harvested these earlier, but didn't get around to it. The taller they grow, the more they end up with a tall, thick stalk that's inedible. So, best to pull them when the bulb is nice and compact.